Once again, we headed northward to claim our stake. Or stake our claim. I can’t remember which way that one is supposed to go and since idioms aren’t my strong suit, I’ll say it both ways just to be safe. Anyway, we pointed the nose of the old truck down the interstate to do some claiming and staking, though not necessarily in that order. Columbus, Ohio, would be home base as we branched out different directions, allowing the road to carry us wherever it deemed fit. Our reason for the trip was to pick-up a Heywood Wakefield China hutch Jill purchased at an on-line auction somewhere between here and there. I am not being intentionally elusive, I truly don’t remember the name of the little town. This time we had a small covered trailer in tow since it was raining, and since rain was forecasted for the entire weekend. We took all back roads out of Lexington for the duration northward. We arrived at our first stop…a sleepy little town complete with a Main Street, a pair of barely used stoplights on opposite ends of the town, and a genuine small town feel to the whole place, despite the dreary misting rain. 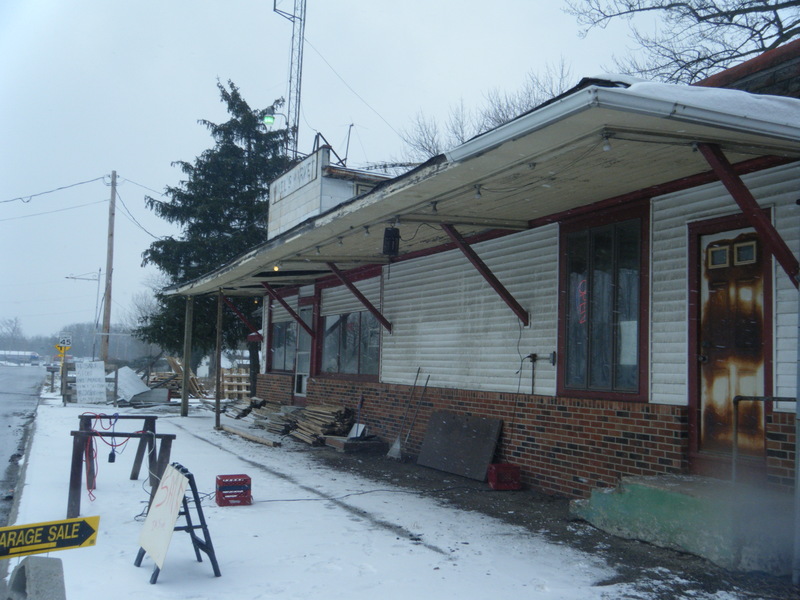 Inside we found a combination retail shop / on-line auction house / karoke bar / coffee shop / chili emporium. I’m not sure which business was most successful, but on that cold day the chili was by far the leader, in pungent smells if nothing else. Jill settled up while I began loading our wares into the Suburban and trailer. When I returned, Jill and the shop owner were waste deep in serious negotiation. I kept my head down…never look a negotiating woman in the eyes…and kept loading. In my mind I imagined Jill saying, “Now listen. When he comes in, lets pretend to be talking about price or something of the sorts. That way he will keep loading and I don’t have to go out into the rain.” I know that wasn’t true, but what husband hasn’t plotted his own wife’s demise while on the heavy end of a lifting assignment. Turns out, Jill was negotiating. 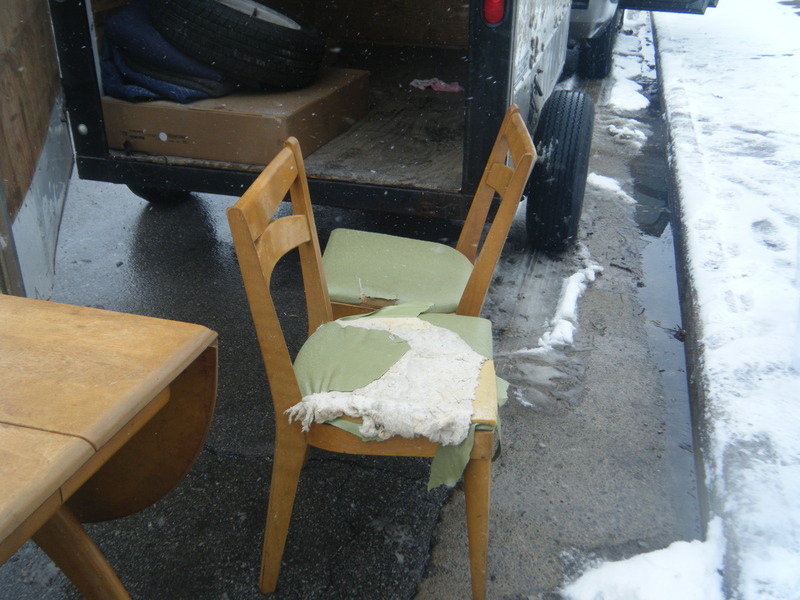 She ended up purchasing a Heywood Wakefield dining table with chairs that had not hit the online auction website. 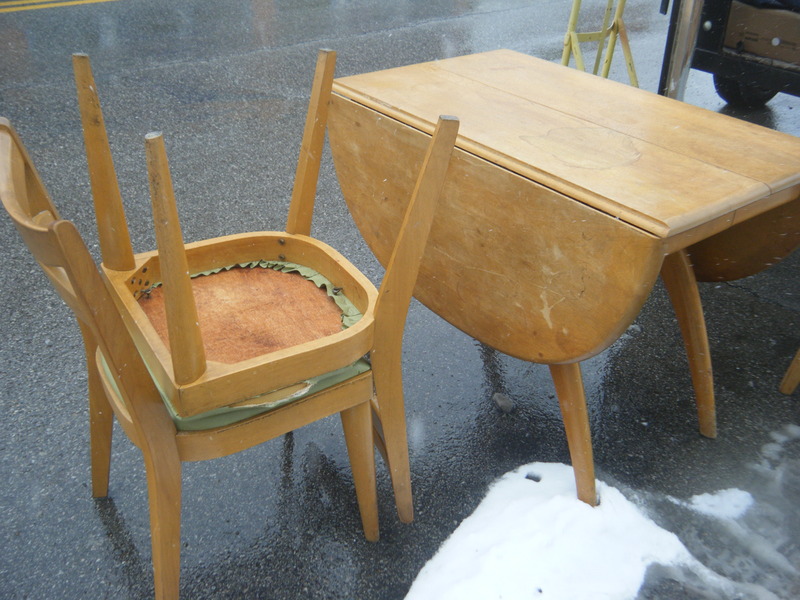 The ensemble was in rough shape, or I like to call it, ready-to-be-refinished shape, but the price was reflective. With a little elbow grease, there might be life left to breathe into this formerly cool Mid-Mod piece. Everything was loaded, strapped down, tied down, roped down and taped down, so we went thru the final (otherwise known as other) stoplight leaving town and back onto the backroads. The rain was still drizzling. Jill had 40’s music humming from the XM Radio, occassionally stealing glances of approval back at her hardware, then appreciative doe-eyed glances at me as if to say “thanks for letting me do this.” Oh my Jill…I can’t say no to her, and she can’t say no to Heywood Wakefield. It is a love-affair of undrstanding that I’m sure will continue for many years to come. On the road of life, detours are what makes the trip, well, a trip. Back-road pickin’ is no exception to this sentiment. 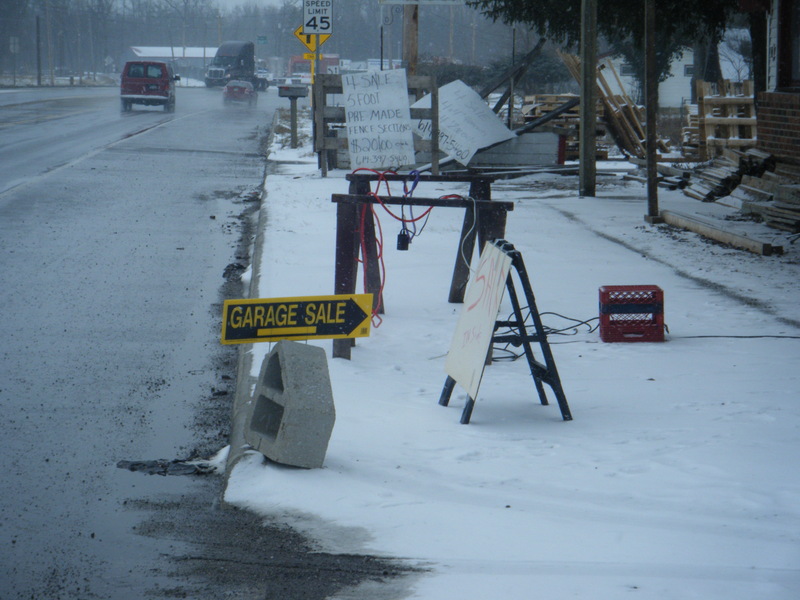 As we blasted down the highway, now to a Jill-selected Patsy Cline soundtrack, I briefly gazed from my intent highway stare to catch, out of the corner of my eye, a “Garage Sale” sign. Garage sale? At the time it was late February with a hefty blanket of snow on the ground. I had to pull an abrupt emergency 180 to investigate. Jill offered encouragement at my abrupt three-point turn disguised as curses coming from her window pressed cheeks. I got our rig under control and prepared to land in front of a busted up old gas station looking shack, barely off the main highway. I parked and we pondered. Was the sign for real? Afterall, there were remenants of gas station signage and I know the fuel stop had long gone. As curiosity began to peak my interest, I tried to ignore the faint wail of imagined banjo music I heard rustling thru the trees. The whole garage sale consisted of the room in which the five of us stood. Looking around was quite literally looking around. That is to say, we had just enough room to spin in a circle to check out their goods, then sideways shuffle to get to another section of the tiny room. Then like a scene right out of Indiana Jones, I found a hidden door. “This included in the garage sale?” I asked. “Well, I ain’t thought bout it. Ain’t much it there…just some old stuff we ain’t cleaned out in a long time. Roofs collapsed in a spot in there…mostly old stuff from an antique shop that used to be in there.” Jills ears perked up like a Jack rabbit on Easter. “Mind if we take a look? I asked. “Naw, sure…s’long as you don’t sue me for falling in no holes.” I agreed and opened the door. Now we were pickin’! And a grinnin I might add. We tried to contain our excitement lest we ruin our poker faces. Jill got in her head down rumage stance while I tried not to get in the way. My job, as usual, was to keep the propiteor semi-entertained so Jill could work uninterrupted. I stumbled upon some cool old decanters at the front of the shop with all the brothers peering at me. “Hmph, it must be your birthday,” I snorted. “Why there ain’t a drop of liquor left in any of these old bottles!” They thought that was halarious, and amongst the back-slappin I believe I was accepted as one of their own. We chatted a spell while Jill made her final selections. 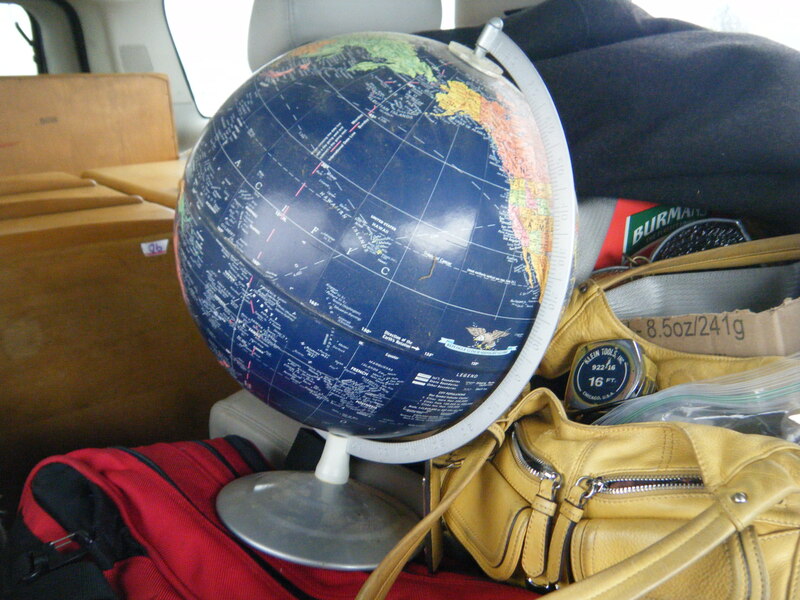 Among the best of the lot was an antique globe, a really cool roll down map and a few of the decanters came with us as well. All in all a pretty good truck, as Huck Finn would say. We paid the gent and said our final goodbyes to the fellows before loading our finds and heading back out on the highway. It’s funny to look back and think about what transpired. Our initial feeling was that of fear…fear of being bound and killed, or worse. But ultimately these were good old boys, just like me. Hell, maybe they had the same initial fear when I said I was from Kentucky. In this world it seems like we are being told more and more to keep up our guard. Now I’m not saying to be nieve. Not at all…just more accepting of things the way they are. Forget what the news yells at us nightly. This counrty is still chocked full of good people. Good people just like our new friends we were fortunate to cross paths with, on some random highway in some random town. While we were seeing scenes from a bad 80’s horror flick, they were just hanging out selling some stuff and celebrating a birthday. 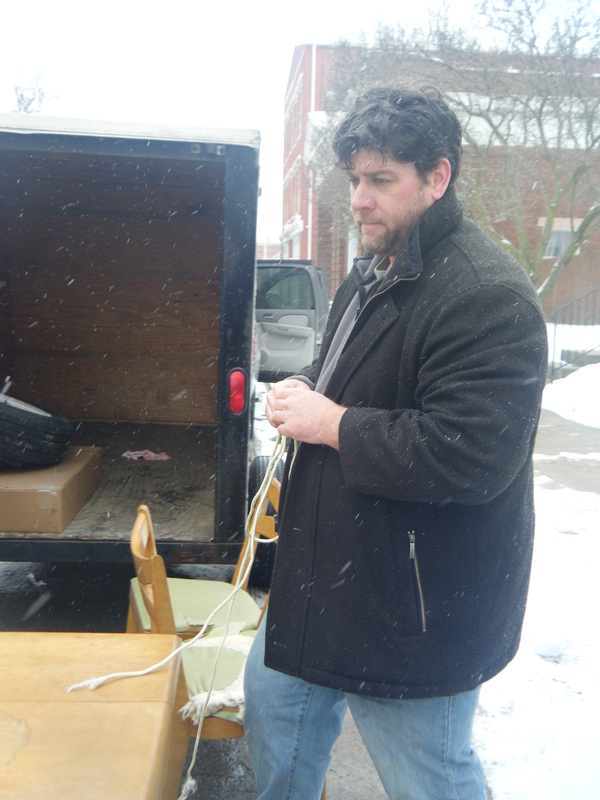 There were some good deals, good items, and above all good people…real good people…at the February Garage Sale.